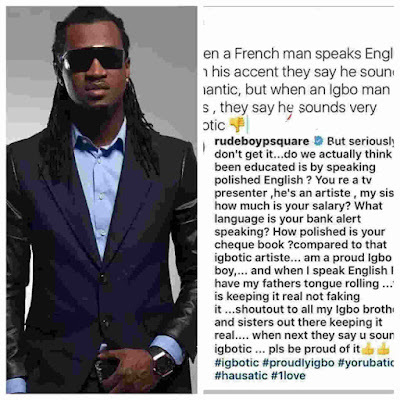 Paul Okoye a.k.a Rudeboy of Psquare who has been trolled on by social media users because of his accent which they describe as 'igbotic', has finally embraced his accent, and asked those who call him out for it, how polished their check book is. According to Paul, when a French man speaks English with his accent, he is said to be romantic, but when an Igbo man tries it, he is said to be Igbotic. Well Paul said, he's proud to be an Igbo man and since he speaks igbotic English, it means he's not faking it.